Made of die cast aluminum, The classic mailbox posts are available in top mounted (#4890), 1-sided (#4891) and 2-sided (#4892) styles and can accommodate rural and townhouse mailboxes. 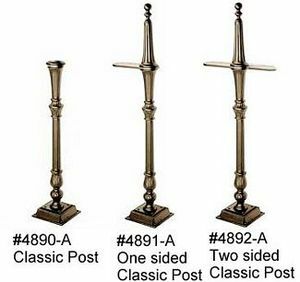 1-sided classic mailbox posts include an 8 1/4" W x 6" D x 3/8" H arm. 2-sided classic mailbox posts include two (2) 8 1/4" W x 6" D x 3/8" H arms. Classic mailbox posts feature a durable powder coated finish available in five (5) contemporary colors. This Post is bolt mounted to a concrete base. A optional in-ground mounting kit easily attaches to the base of classic mailbox posts and allows for in-ground applications.